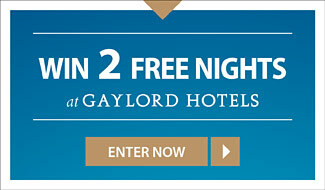 Win 2 Free Nights at a Gaylord Hotels Resort! Sign up for email updates for your chance to win! Ready to enter and get our latest news, offers and more? Sign up below. We'll send you an email newsletter about once a week.